May 4th is Star Wars day. March is a great month for us to celebrate textiles and make more: Edge of the Forest, Threads of Hope for African Grandmothers, and a great opportunity for quilters to respond to a call for entry. Members Melanie Siegel and Rikki Blitt have been instrumental in launching a Surface Design Association Canadian members’ touring exhibit, The Edge of the Forest. Both Melanie and member Barbara Goldstein have work in this wonderful exhibit. And Sheila Thompson, a past presenter at the Guild has been extensively involved. We urge everyone to come out and celebrate their work at its premier opening in Richmond Hill on March 11. Threads of Hope for African Grandmothers at the Miles Nadal JCC. “In honour and admiration of the remarkable African grandmothers, Waterloo-based Omas-Siskona (Grandmothers Together) produced Creating Futures: Threads of Hope for African Grandmothers. They invited Ontario textile artists to create and donate pieces celebrating the ongoing strength and resilience of grandmothers in Africa. The result is a stunning display of artistry, technique and inspiration.” Follow the link in the title for docent hours. Sacred Threads – Call for Entry Juana Sleizer has brought this to our attention. The time frame for entry is tight, but many of you may have qualifying quilts to submit. For more information, click here, or the title above. On Tuesday January 20 Pomegranate Guild member Barb Goldstein led the members of Hadassah – Hatikvah chapter of Thornhill in a bracelet felting session. Colourful fleece, some soapy water, and Barb’s engaging instruction left participants with beautiful bracelets to take home. Melanie Siegel and Karen Chisvin attended to help with set up and chat about the other activities of the Pomegranate Guild, welcoming all participants of the evening to become guests or new members of the Guild. 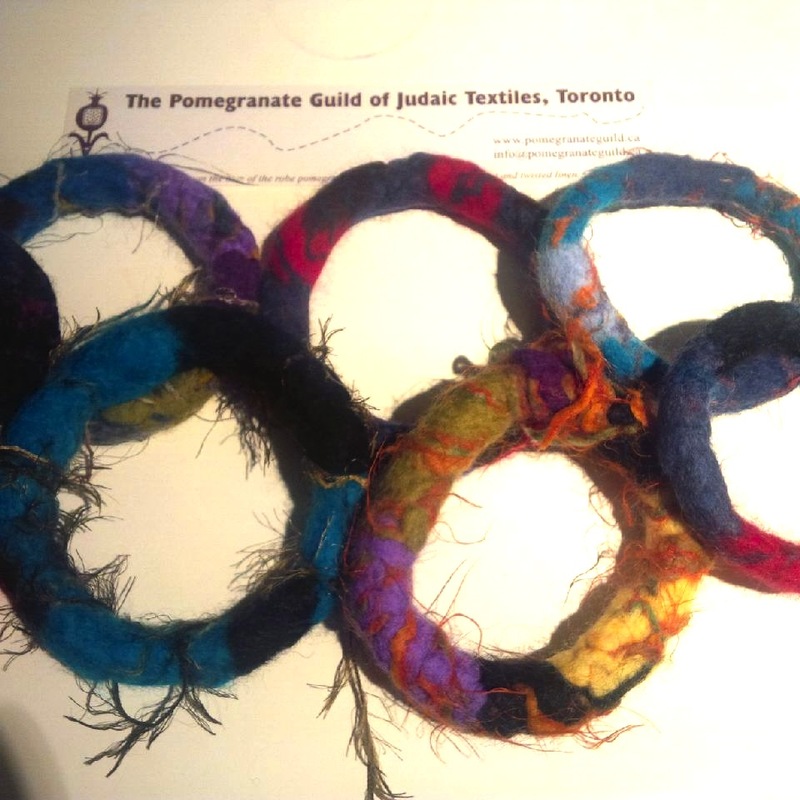 What’s Jewish about felted bracelets? Their bagel shape, and an artful outcome of being under intense pressure! Anna reports: With illness overtaking our scheduled guest artist, our own Melanie Siegel, artist and Exhibits Chairperson, stepped in on a moment’s notice to provide an exciting programme for the evening. And what fun it was! Melanie introduced us to a technique of felting bracelets and then demonstrated the process. She created a basic form with neutral fleece, by wrapping it around her hand and securing the wrap with wool yarn. Then, layers and layers of exotic colours of our choice wrapped round and round the form. All members got busy immediately, wrapping and wrapping and wrapping. Then we dipped our hands in water and mild soap. We rolled the bracelet between our hands, feeling it firm up as the felting process proceeded. What quick workers Guild members are: in an hour we completed what is often a 3-hour process. We set our bracelets aside to dry and imagined the embellishment we might later do with beading. Once the drying started, Melanie also taught us how to felt beads out of the fleece wool. Then, by rolling the fleece in a bamboo mat, she demonstrated how we could make snake-like shapes – to add a Rastafarian look to our hairdos? Finally, Melanie shared with us her love of her new felting machine. How lucky we are to have such a talented, creative and imaginative member as Melanie in our group! She is truly a Pomegranate treasure. Thank you, Mel.